Much like Genkaku Picasso, March Story is very “artsy” (I’m noticing a pattern here Kate), and isn’t something I would normally pick up on my own. I enjoyed writing this review a bit less than the last one, but that probably has more to do with the fact that Genkaku Picasso, while strange and somewhat dark, is still a comedy, my favorite manga genre. March Story is a horror, generally my least favorite genre in anything. How does it hold up against the stacked deck of my preferences? Read on and find out. Before we begin, I feel obligated to point out that those of you with small hands, like myself unfortunately, will not be amused by the non-standard size of the book. I read my manga by placing my thumbs at the edge, and the rest of my fingers along the spine. March Story is just too big for me to do that. The binding however is a lot less stiff than that of regular manga volumes, and makes it easier to open the book. So I guess there is that to say for it. 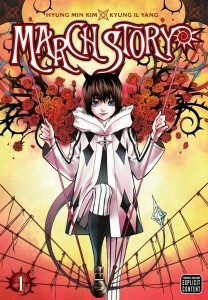 The story centers around March, a young girl who hunts evil spirits known as Ill that inhabit beautiful objects and posses humans by tempting them to pick up the cursed object. From the very beginning it is clear that we’re in for a bloody ride, as a horned girl crouches over the remains of her family. March takes out the possessed girl, and takes an earring from her, she then heads out to hunt down the earrings partner. Anyway, one of the Clowns is a girl name Pircollet, who wants to be a trapeze artist instead of a Clown. March meets her and tells her about the Ill, and about the earring that she is hunting down. She tells her that because of these spirits she should never pick something up if she doesn’t know what it is. While Pircollet gets ready for her show, she notices an earring laying around, and refrains from touching it because she remembers what March said about not touching something if you don’t know where it came from. Of course she doesn’t remember the part about the evil earring, as the temptation is too great and she picks it up anyway. Clown college’s standards must have slipped, because this girl is a moron. March intervenes and reveals that she has the same power as the Ill. So this manga is basically your typical “Vampire hunts other Vampires” manga. Just with different trappings. Also, I would like to say that the phrase “After all, I’m a Clown” can never be said with dignity. Ever. I have a few issues with this manga. The first being that a lot of the tragic elements seem to hinge on the people involved being complete idiots. Pircollet clearly heard March mention an evil earring, but either she didn’t listen or she forgot. Either way, she gets a stupid sign. The second story opens with a young woman being dropped to her death, and we later find out that the city is haunted by a spirit who kills people that don’t wear masks. Obviously people know about this, which is why they wear masks. So chances are the girl we see die at the beginning either was careless, or just plain stupid. Which brings me to the victims of the Ill. The demons in the art don’t even bother really trying to tempt their victims. All I see is them saying “Pick me up” over and over. Not exactly subtle. And we’re never given any reason why the victim picks up the item, despite the fact that they can clearly hear the voice of the demon. I’m pretty sure that an intelligent person would know not to listen to the voice with the evil font. I can respect March Story for being a horror. I don’t particularly like horror, but I do believe in the sanctity of genre boundaries. Among those is the boundary between horror and comedy. It is rarely advised for the two to mix. Granted it’s been done before, but in order to be done properly the creators need to be dedicated to going all the way with it. March Story on the other hand tries to ham in some comedy among chapters with otherwise gruesome imagery. I’ve noticed this trend among manga before, where the mangaka adds in a panel or two of gags, despite the complete inappropriateness of it. A good rule of thumb is that if you start off your manga with a body count, chances are you don’t want to be going for comedy. I’ve read manga that started with comedy before and then went into high octane nightmare fuel, or just went over the top in the graphic department. Needless to say, I was not amused. The art is interesting in its own way, as it doesn’t quite look like the regular manga fare most mainstream fans are used to. I attribute this to Kyung Il Yang’s beginnings as a manwha artist. While superficially the styles resemble each other, there is a subtle difference between them that the trained eye can pick up on. In my case I read a lot of manga and can tell that this doesn’t look like regular manga, but I couldn’t point out why exactly if I was asked. I won’t say March Story is a bad manga, but it isn’t my cup of tea. The graphic elements are over the top, and come across more as attempts at portraying depth where there is none. The stylized art works against any attempts to create atmosphere, and really doesn’t carry any real sense of personality with it. The first two chapters are methodic and lackluster, while the third chapter breaks from formula and turns into something that actually manages to get the reader asking questions. Chapter four delves into the back story of the main character, which while interesting in its own rights, goes overboard with the graphic imagery. It ties together some plot points from previous chapters, but doesn’t really entice me to keep reading. I will confess to a slight curiosity to find out what happens next, but it isn’t strong enough to get me to pick up the next volume. Horror just isn’t my thing and I get the feeling that if I did want to read horror I could do better than March Story.